Hi everyone!! 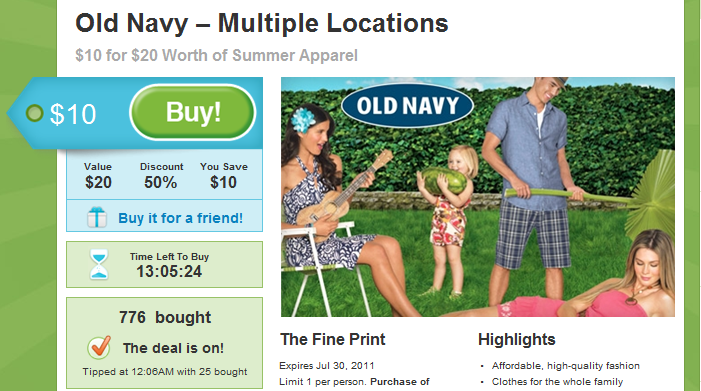 This deal is too HOT not to share! 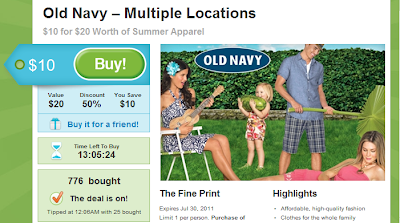 Right now GROUPON has a National Deal where you can get $20 to shop at Old Navy for only $10! That is like GOLD to me, lol... I never have trouble finding purchases for my entire family there. Not only that, if you shop through EBATES to get to the Groupon page, you'll get an additional 3% cash back on the $10 purchase of the GROUPON! If you have any questions about how either Groupon or Ebates works, feel free to email me or leave a comment! I'd be happy to help.